I had my black brogue boots re soled and re heeled - Brodies did a FAB job and were much less expensive than the guys on Goodge Street! I recommend these guys 100%! This shop was advised by a friend. He repaired my wallet and another one 6 months later. Did great jobs, very friendly guy, who will find a way somehow to fix your problem. Bit of a travel for me, but it's worth it. Highly recommanded. 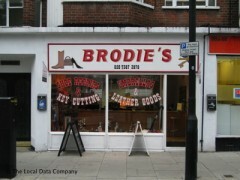 Had a batch of shoes/boots repaired here once. Reasonable job and on time, but expensive - so I was disappointed when one sole started falling off a boot before I had worn them. I am sorry you were disappointed with the services that I offer. With regards to the problems that you had I would have appreciated it if you would have spoken to me first before publishing negative online comments, I would have gone out of my way to help you free of charge. So for any customers who read this, I can assure you that you have nothing to worry about as I pride myself on good quality repairs at a competitive price. Went to Brodies the other day for the first time, needed my heels done urgently for that evening, the guy did my heels straight away. He did an amazing job, my shoes were ready for the bin and I swear they looked like new again! Reasonably priced too, I'm impressed.